Free SEO Checker | Quickly audit & generate an SEO report right now! Check your SEO right now! Confused by SEO pricing structures? We break it all down for you! Want to drive more traffic to your website and earn more revenue for your business? With our free search engine optimization (SEO) reporting tool, you can uncover weaknesses in your SEO strategy, plus discover strengths. Even better, you can see how your webpages stack up against a competitor’s webpage. Just add the URL of the webpage you want to audit or the URL of webpages you want to compare. Why audit your SEO strategy? In today’s competitive online market, it’s critical that you audit your SEO strategy — and a free SEO checker makes the process hassle-free. SEO, which allows you to optimize your website and online content to reach your target audience, focuses on making it easy for search engines, like Google or Bing, to read your website. It also emphasizes creating original and valuable content for your target audience. When you take those steps, your webpages rank high in search engines. In short, it leaves your business at a disadvantage and gives your competitors an advantage. With a comprehensive analysis by our free SEO checker tool, you can revamp your SEO strategy to propel your website to the top of search engine results pages. In turn, your website stands out to users. 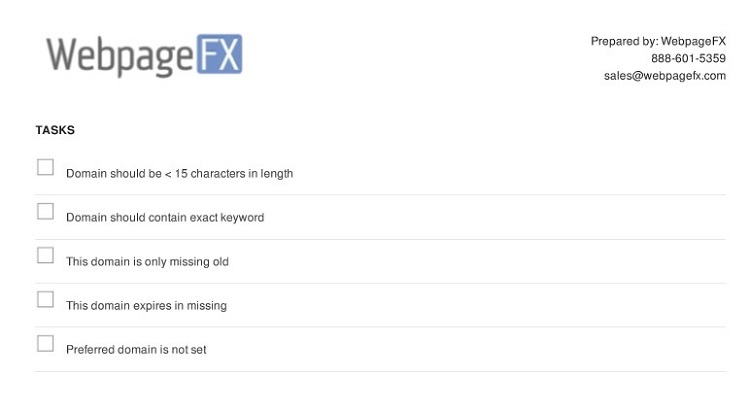 Our free SEO checker tool assesses those factors. It looks at your URL and site speed, as well as your webpage’s title, description, and heading tags to ensure that they are optimized to help you rank for the keyword or phrase you entered. For more detail on those factors, keep reading! What does our free SEO audit tool check? The speed of your website not only matters to search engines but also to users. In fact, more than 80 percent of users expect a website to load in two seconds or less — if the website takes longer, they’ll likely leave, which increases your bounce rate. That’s why our free SEO checker tests the speed of your webpage. When we assess your webpage’s speed, we also look at its size, which we measure in kilobytes. In the example below, you can see the webpage takes more than two seconds to load. While that may seem, “good enough,” a one second decrease in your page loading times can improve your conversions by seven percent. If you have 500 conversions a quarter, that translates to 35 more. Depending on the value of your conversions, that could mean thousands of additional dollars in revenue. Keyword: When you set the keyword of a webpage, it’s helpful to include the primary keyword in your URL. It helps improve the SEO strategy of your page, which can lead to a better ranking in search results. Underscores: When creating a webpage URL, it’s a common mistake to separate words with underscores, versus hyphens. That’s why our SEO checker looks for underscores. If it finds any, it’ll notify you in your free SEO report. 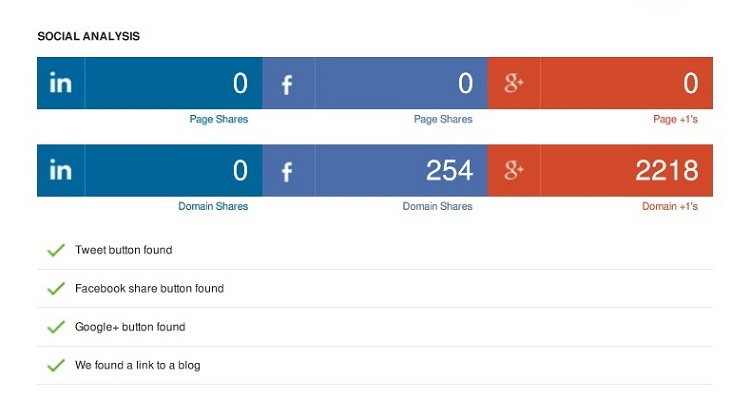 Based on these factors, our SEO analyzer will determine if your webpage is SEO-friendly. Length: For the best results, title tags should have 70 characters or less. If they exceed that number, search engines won’t display the excess. Instead, they’ll insert an ellipsis, which can leave your title tag without a hook. Keyword: A title tag should also include your primary keyword. While not required, it’s beneficial if your title tag starts with your primary keyword. Our SEO audit tool will let you know if it does. In most cases, title tags are a quick fix, though they require some brainstorming. Length: Like a title tag, a description or meta tag also has character limits. Your description tag should not exceed 160 characters — otherwise, it won’t display in search results. It’s worth noting that in some instances Google will rewrite your description tag. Keyword: A meta tag should also include your primary keyword — specifically, the exact keyword. That means if your keyword is, “holiday decorating guide,” you want to use that exact keyword and word order, so the phrase, “guide to holiday decorating,” wouldn’t count. To make our audit report easy to follow, we include your description tag in the report. After our tool assesses your title tag and meta description, it evaluates your heading tags. These tags feature throughout the content of your webpage and tend to include the keywords you’re targeting. They’re also helpful for readers, as they divide your content into neat, easy-to-follow sections. Maximize your SEO strategy by including an H1 tag, as well as H2 tags. Depending on your content, you may also have H3 and H4 tags to make your content even easier for audiences to read. Our SEO checker tool will look for H1, H2, and H3 tags — if you’re missing them, we’ll let you know. Our tool will also look for your primary keyword in your heading tags. To improve your SEO strategy, you’ll want to include your primary keyword in your heading tags, especially your H1 tag. If your keyword would impact the readability of your H2 and H3 tags, consider leaving it out. To close our SEO audit of your heading tags, we look for any duplicate tags. In the online world, content is critical. You need to provide your viewers with original content that offers value, or your webpages will struggle to rank. Even worse, users won’t stay on your webpage or convert, which defeats your overall goal. Word count: Depending on your keyword, you may need to create content that encompasses a few hundred to a few thousand words. Our SEO audit tool will provide you with a recommendation, which can help you when revising your webpage. Keyword use: If you’re familiar with search engine optimization, you know keyword stuffing is a black-hat practice. You still want to use your keyword, however. In most cases, use the exact version of your keyword three to four times in your copy. Keyword placement: To help search engines understand your content, it’s important that you use your primary keyword within the first 100 words of your copy — so under your H1 heading. Our tool will let you know if you need to add your keyword to that initial copy. Anchor text: Within your content, you should link to other webpages on your site. For example, the phrase, “contact us,” would serve as anchor text that links to your contact page. Our SEO checker looks to see if you use your primary keyword as anchor text, such as for a service page. Sitemap: A valuable feature for your audiences, as well as search engines, is your sitemap file. When it comes to your copy, we’re evaluating your sitemap.html file — we assess your sitemap.xml file when reviewing your code. In most scenarios, a sitemap.html file is essential. If our tool spots issues with your copy, it’ll include actionable recommendations in your SEO report. It’s essential to include images in your copy. By including images, whether pictures or graphics, you’re providing readers with a visual that helps them digest your content. If you’re explaining a complex process, for example, a graphic is invaluable. Filename: For your sanity, as well as for search engines, it’s essential you develop a naming system for your image files. Don’t settle for a filename like, “IMG_0001.” Instead, use your keyword — if appropriate — and separate words with a hyphen, not an underscore. Alt tag: Since search engines cannot “read” images, it’s critical that you include an alt tag. Create descriptive, no-fluff alt tags that explain what’s going on in your image. If appropriate, you should include your keyword in your alt tag. Once you develop a process for naming your images and composing their alt tags, it’ll become a habit. The next step in our SEO audit focuses on your webpage’s code. In most cases, you’ll want your development team to look over this part of our report, as they’ll need to make the necessary changes to improve your webpage’s SEO. If your development team’s short on time, prioritize your sitemap, Flash, and CSS recommendations. Another factor our SEO checker assesses is your page links. In search engine optimization, link building plays a critical role. While your content likely includes links to content on your website, you also want your content to earn links from external websites. That’s a challenge for many businesses, as you need to create content that’s unique and compelling — content that journalists, users, and publishers can’t help but share. Even if you do publish a piece of exceptional content, you often need to connect with publishers to highlight your one-of-a-kind content. While our SEO analyzer doesn’t provide tips for how to conduct outreach, it does offer you a summary on the number of links you’ve earned, as well as the number of links you’ve earned from unique domains, on your webpage and website overall. For example, if Martha Stewart links to your guide on holiday decorating twice, that only counts as one unique domain. While those shout-outs are wonderful, you want to have a diverse set of links. That diversity indicates that a variety of websites trust yours. In addition to summarizing your external links, our tool will compile the number of links to internal webpages. We’ll also include the domain authority score of your website, plus the trust rank of your webpage. Assessing the SEO strength of a webpage also involves a domain analysis. That’s why our SEO audit tool evaluates your domain — the domain of this website is “webfx.com,” for example. As a part of our domain analysis, we’re looking at several features. When it comes to addressing these items, you’ll want to coordinate with your development team. In some instances, you won’t have any actionable steps you can take. The age of your domain, for example, is something you can’t change. With more than 50 percent of all Internet traffic coming from mobile devices, it’s critical that you have a mobile-friendly website. The fact that Google’s adopted a mobile-first index makes it even more of a priority to support a mobile website. Like our tool’s coding assessment, you’ll want to forward this part of the report to your development team. They can often make the necessary changes. If you’re without a mobile-friendly website, however, aim to launch a responsive or dynamic website. In addition to analyzing the technical elements of your site, we’ll also perform a social analysis that details the number of domain shares on LinkedIn, Facebook, and Google+. We’ll also check for the presence of a tweet button, Facebook share button, Google+ button, and links to your blog. In some cases, you may opt not to include social buttons on your webpage. If you’re analyzing a webpage that would benefit from social buttons, however, consider coordinating with your development team on adding them to that webpage. Once our SEO checker tool evaluates your website, we’ll deliver your report to your email address. Our report opens with a summary of your landing page and designated keyword, as well as an overall score for your webpage on a scale of 0 to 100 percent. We’ll also note the number of issues discovered, as well as the number of positive signals uncovered. It then concludes with a list of actionable recommendations. Keep in mind that these are recommendations. Depending on your business and its unique SEO strategy, some of these suggestions may not apply to your approach or characteristics. If you need help resolving your task items, you can always contact our experienced strategists. Looking for fast answers to questions about our SEO checker? Check out our FAQ below! HOW DO I USE THE SEO CHECKER? Click, “Scan Now,” and we’ll evaluate your website. Check your inbox for our handy PDF report. Compare your webpage against a competitor by supplying the information above and then adding the URL of your competitor’s webpage. Click, “Scan Now,” and we’ll investigate both webpages before delivering your SEO report. HOW MANY PAGES CAN I CHECK AT ONCE? With our SEO checker, you can test one page at a time, plus one competitor’s page. If you’re reviewing multiple webpages, we recommend creating an Excel or Google Sheet document. Here, you can build a plan for revising your SEO strategy by noting the recommended changes. WHAT DOES MY REPORT’S PAGE GRADE MEAN? The page grade assigned by our SEO checker depends on several factors. We consider the positive signals of your webpage, as well as the negative signals. Our tool also assesses the severity of these signals. For example, a mobile-friendly version of your website is more critical to search engines than social media buttons on your webpage. If you need help prioritizing tasks for improving your SEO, you can contact our award-winning team. HOW DO I FIX MY WEBPAGE’S SEO ERRORS? Our actionable tasks provide guidance on how to fix errors caught by our SEO checker. If your webpage needs additional content, for example, we’ll provide a recommended word count. For guidance on these recommendations, consider browsing our guides and blog, which offer a wealth of resources for SEO. HOW MUCH DO THESE ERRORS IMPACT MY WEBPAGE’S RANKING IN SEARCH RESULTS? It depends, as search engines use a variety of ranking factors. Google, for example, relies on more than 200 ranking factors, though some have more weight than others. Link building, for instance, is one of the most influential ranking factors for Google. WHY DOES MY WEBSITE RANK WELL, BUT EARNS A LOW PAGE GRADE? Depending on your industry, it’s possible that you have a well-ranking page with lackluster SEO. This scenario does happen and often occurs because your competitors aren’t optimizing their pages either. It’s critical to adopt a proactive approach to SEO, however, as someone will eventually optimize their pages. WHEN SHOULD I RECHECK A WEBPAGE? While you can recheck your webpage at any time with our SEO checker, we also recommend tracking your changes through your Google Analytics account. If you’re making sweeping changes to a webpage, for example, you may want to create an event in Google Analytics that indicates this change. You’ll also want to monitor your ranking in search results via Ahrefs. WHAT SEO FIXES CAN YOU HELP WITH? As a full-service digital marketing agency, we can help with every aspect of your SEO checker report, from link building and copywriting to page speed optimization and mobile web design. We also provide in-depth SEO audits, which can help you take the next step in relaunching your SEO strategy. We publish all our prices online to offer you and your team complete transparency. For more information about search engine optimization, from tips to strategies, visit our blog. You can also check out our custom SEO plans and prices to retool your SEO strategy for success. Or, contact us at 888-601-5359 to speak with an SEO specialist. What are you waiting for? Try our free SEO checker, and start optimizing your website today!